2015 feels like a lifetime ago when the Southern Dolphins earned a historic playoff win that seemed to be the start of a promising turnaround to their football program. 2016 didn’t come with nearly the same kind of success, pushing the Dolphins back two steps after their monumental leap forward in 2015. 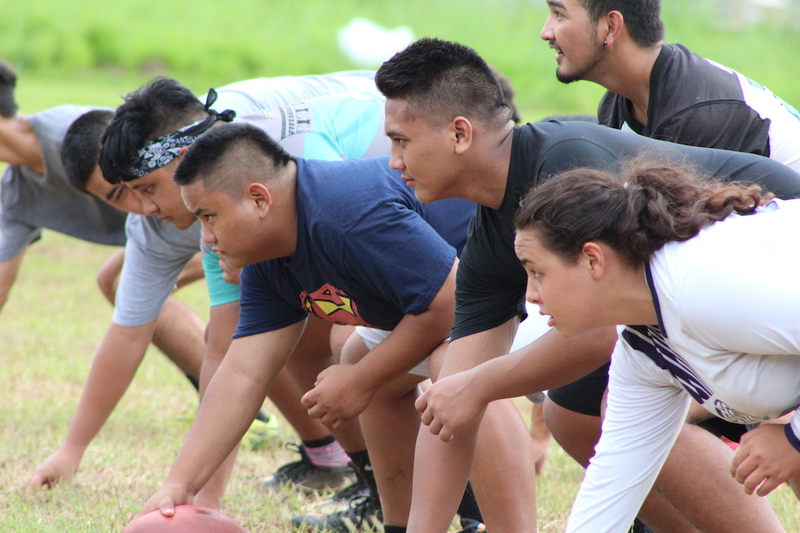 Now under new head coach Jonas Escuadra, a Southern Dolphin 2001 alumni, the team is stripping away lofty goals and expectations and are instead focusing on growth in the sport with young and willing athletes. Escuadra also admitted his team has a lot of talent, but the lack of numbers continues to stunt their on-field capabilities. “We’ve been getting good numbers and it’s been getting better everyday. For a school this big, we should have bigger numbers. The past year was a downfall, but it was my main goal during my first year to get these guys motivated to come out to practice. Now I’m seeing more smiles on their faces after practice and we’re starting to come together as a team,” said Escuadra. Southern will have new coaches on the sidelines, but over a handful of veterans will provide familiarity to the ever-changing Dolphin system. One Dolphin, a former All-Star Game participant, Dylan Parke has been quarterbacking Southern since his sophomore season. The current ND student hasn’t lost faith in his Dolphin teammates and returning for his senior season speaks strongly of their relationship. Receiver Jared Gomez is another key returnee who’s ready to make a bigger impact in his senior season while being successful as a team. “It’d be great to win another playoff game. We understand the game more and we’re having a lot of fun with this years coaching staff,” said Gomez. With a short handed roster, Gomez assures his team’s conditioned ready to play every down, all season long. “Some of us have done it before so we’re ready to play on both sides of the ball all season long,” added Gomez. Coach Escuadra has entrusted senior, and third-year linebacker, Ian Dimla to lead the defense after working his way up to the role from the defensive line. Dimla only played in two games his junior year and he’s ready to prove his worth during his final year. “I’m hoping to accomplish a spot on the All-Island list for linebacker, so we’ll see how this goes,” said Dimla. The blending of new talents with the veterans has been a trying process, but Dimla and the rest of the veterans are embracing the challenge. “The new players have experience playing football so having them catch up to high school football speed has been too tough. We’ve worked with them all off-season and now we’re ready to bang,” added Dimla. Dimla said the strength of his teams defense will be in run stopping. The Dolphins will travel up north to face the Sanches Sharks in the IIAAG season kickoff Friday at the Okkodo Field at 7 pm!